These two men are manumitted slaves. Manumission is the act of a slave owner freeing his or her slaves. They borrowed the clothes and the hats just for the picture. It’s a posed photograph and a statement about being manumitted rather than a picture of a woman posing with her slaves. To answer the question of why they are dressed up but shoeless – it’s part of the old custom of using shoes to denote class, position, or wealth. It was highly traditional that slaves be barefooted. Some countries went so far as to mandate that slaves always be without shoes. The motivations of slave owners in manumitting slaves were complex and varied. Firstly, manumission may present itself as a sentimental and benevolent gesture. One typical scenario was the freeing in the master’s will of a devoted servant after long years of service. This kind of manumission generally was restricted to slaves who had some degree of intimacy with their masters, such as those serving as personal attendants, household servants, secretaries and the like. In some cases, master and slave had had a long-term sexual relationship. Owners sometimes freed the woman and children born of such relationships. Freedom, of course, did not alter much of the external appearance of African-born ex-slaves; they could not be easily distinguished from their enslaved counterparts, who constituted the majority of the African-born population. Whether enslaved or freed, most had been born free in Africa, and their shared cultural otherness distinguished them from the Brazilian-born population of African descent. There were only a few visible signs of their newly acquired free status. First, ex-slave street laborers who worked in gangs, as porters, transporters, and artisans were not chained at the ankle or neck. Second, ex-slaves were entitled to wear shoes; the British lady Maria Graham describes shoes as the “mark of freedom” in her travel journal. Perhaps with their shoes on, African-born slaves of both sexes continued to work with their co-workers of African birth, both slaves and ex-slaves, side by slide, and were engaged in the same occupations as when they had been enslaved. Their jobs could have been stigmatized by association with slavery, and the free-born population may not have wished to take them up. But it was African-born people’s unique occupational skills that enabled them to earn extra money as slaves and to purchase their freedom in the end. There was a law in place for quite some time that freed slaves could not disrespect their former owners or else their manumission would be declared void and they’d go back into slavery. When a litter has a roof, it’s called a palanquin. Thanks for that history new to me. She is beautiful - Gisele Bundchen's Great Grandmother? and the tall guy has a totally cool stance. I hope his post-slavery life went well. As an australian visiting relatives in Manchester UK the street was horrified that I went around barefoot. These old class things still exist, unfortunately. Hi, Brazilian historian here. There is no historical indication that those men were manumitted slaves. There is only two originals of this picture, and none of them has any indication of who were the woman, and why the picture was taken. 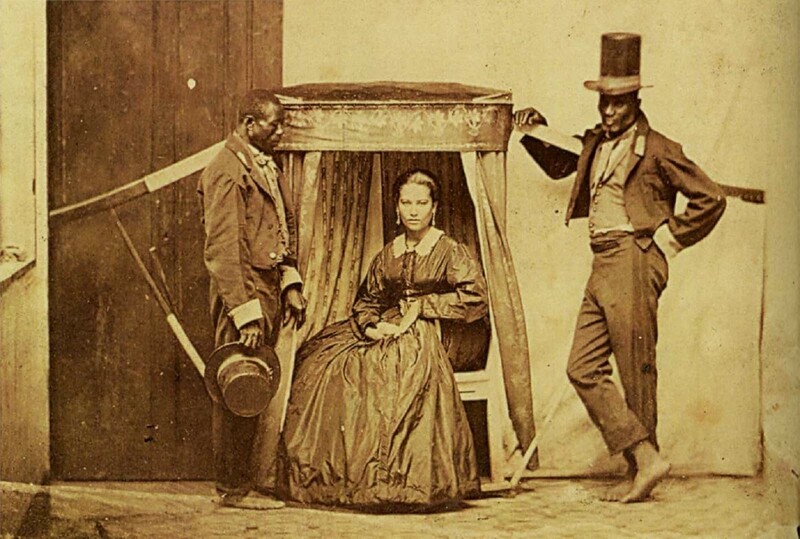 In Brazil, take pictures with slaves were not unusual at all. So, it's higly probable that those men were, in fact, slaves.